Jamal and Omar want to sacrifice their own animal during ‘Eid ul Adha, however, they have a small problem… Enjoy & Share! 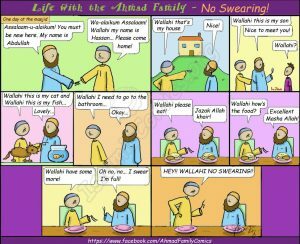 Here’s a classic Ahmad Family comic about Ramadan! 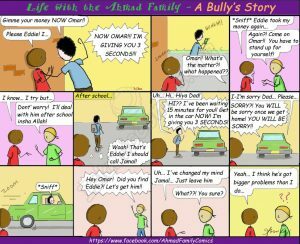 In this comic, Jamal learns a valuable lesson about Ramadan and tries to apply it in his life! Did you know that some people kill the same animal TWICE? How cruel! Read this Islamic comic to learn why this happens and how we can stop it! This Islamic Comic strikes a powerful blow for woman’s lib! Would you like a printed copy of the Ahmad Family Comics? Click here to get your copy! Sound familiar? Well, as bad as swearing sounds, many people are already doing so – Wallahi! In this Islamic Comic, we’re reminded to understand someone’s situation before judging them. 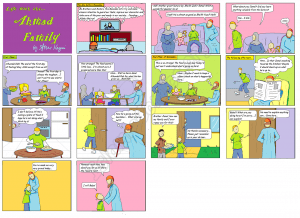 Would you like a printed copy of the Ahmad Family Comics? Click here to get your copy! Ever heard the saying ‘think before you leap’? 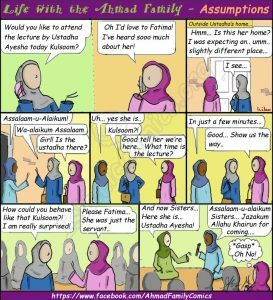 In this Islamic Comic, Umm Jamal and her friend Kulsoom find out just what that means! Would you like a printed copy of the Ahmad Family Comics? Click here to get your copy! 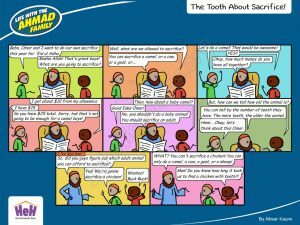 In this thoughtful Islamic Comic, we get a reminder to think of all our fellow Muslim brothers while we’re having fun! Have you ever gotten your dream item, then discover its not really worth the cost? 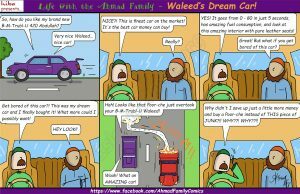 In this great Islamic Comic, find out what happens to Waleed and HIS dream car! 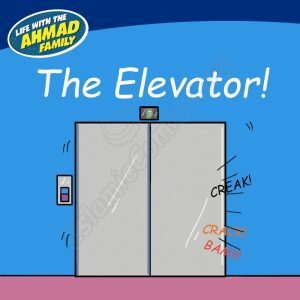 Would you like a printed copy of the Ahmad Family Comics? Click here to get your copy!